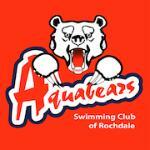 Aquabears swimming club has had many successful years with a number of our swimmers achieving international success. Three of these swimmers all represented Great Britain at World Championships. There have been many successes at national age and youth championships over the years and the club will continue its drive for excellence in the future.